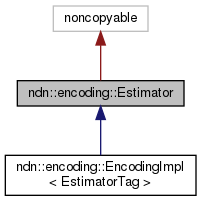 Helper class to estimate size of TLV encoding Interface of this class (mostly) matches interface of Encoder class. Definition at line 35 of file estimator.hpp. Definition at line 42 of file estimator.hpp. Definition at line 51 of file estimator.hpp. Definition at line 60 of file estimator.hpp. Definition at line 69 of file estimator.hpp. Definition at line 79 of file estimator.hpp. Definition at line 89 of file estimator.hpp. Definition at line 28 of file estimator.cpp. Definition at line 45 of file estimator.cpp. Definition at line 51 of file estimator.cpp. Definition at line 68 of file estimator.cpp. Definition at line 74 of file estimator.cpp. Definition at line 84 of file estimator.cpp. Definition at line 90 of file estimator.cpp. References ndn::Block::hasWire(), prependByteArrayBlock(), ndn::Block::size(), ndn::Block::type(), ndn::Block::value(), and ndn::Block::value_size(). Definition at line 101 of file estimator.cpp.